Burger Fabriek in Amsterdam: Best meat in town! This restaurant is one of the newest hotspots in town. Burger Fabriek (translated in English as Burger Factory) on Reguliersbreestreet opened its door on July 24th 2015. 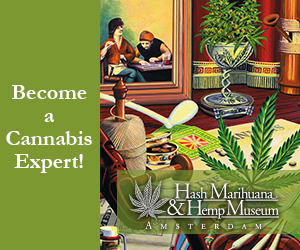 It’s right in the city centre of Amsterdam and just next to the popular Rembrandt Square. This square is named by the famous Dutch painter Rembrandt van Rijn. It’s one of the many entertainment areas in town. 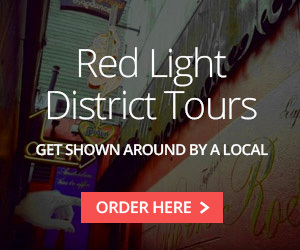 The area is pretty much surrounded by bars, cannabis shops, clubs and restaurants. Ah, when we entered the bar it smelled so good in there. We wish that you could smell what we smelled here! Besides that, the interior looks very trendy. 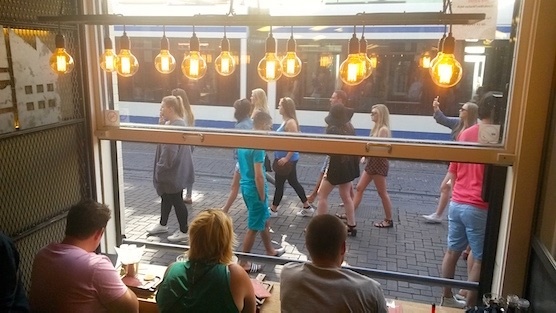 Instead of the remarkable plastic seats and fluorescent lights in most fast food bars, it shows the owners of Burger Fabriek put a lot of effort in the ambience. The concept is a mixture of old essence and modern influences: The interior looks industrual with warm wooden accents and a contemporary open kitchen. We chose the American Burger with onion, pickle, tomato, cheddar cheese and BBQ sauce and the Mexican Burger with jalapenos, onion, guacamole and spicey chimichurri. And what a great choice! 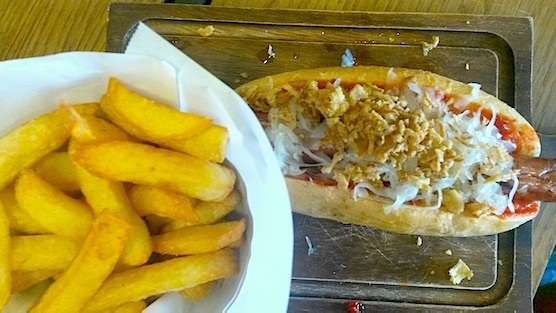 Burger Fabriek sure knows how to deal with them burgers, fries and hotdogs. Besides the great fresh toppings, the charcoal treatment is very noticeble! The burgers have a great smokey taste! Do you know what the real difference is between a weak burger and a burger that has strength? A weak burger you can chew and still talk. A burger with strength you chew and talk, the meat just absorbs all the space and air possible in your throat. To the point that if you wanted to start talking, nothing but “hmm-hmmm-hmmm” comes out. 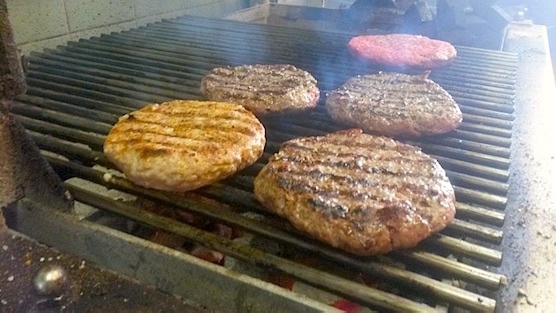 This is how the burgers at Burger Fabriek are! The American Burger with fries. 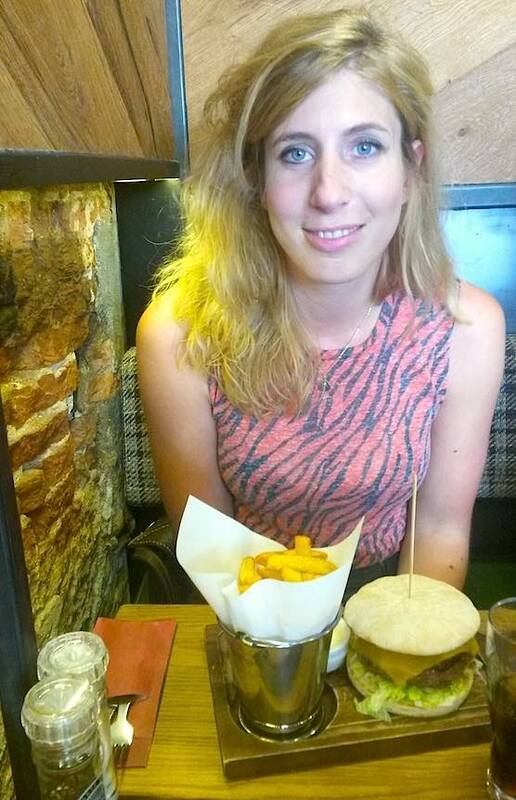 The burgers at Burger Fabriek are served with Dutch fries, which are an absolute must-eat when visiting Amsterdam. They are fabulous-crispy from the outside and tender on the inside. You bite the fry, the fry bites back. That’s when you know you’re having an official Dutch fry. And Burger Fabriek used the right amount of salt too. It’s like the flavor of the fries, they blend so perfectly if you don’t touch them right away. 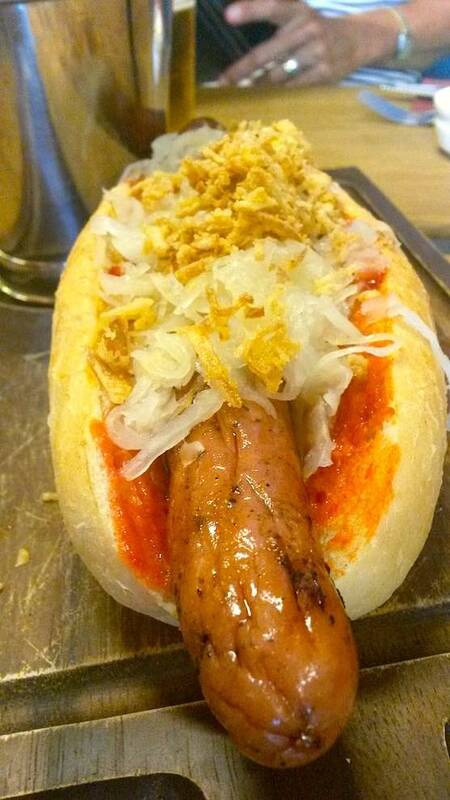 So, McDonalds and Burger King: Eat your heart out! The folks at Burger Fabriek in Amsterdam sure know how to make an official burger. Our advice: Go here and try yourself! So yeah, we’d definitely recommend going here! How to get to Burger Fabriek? 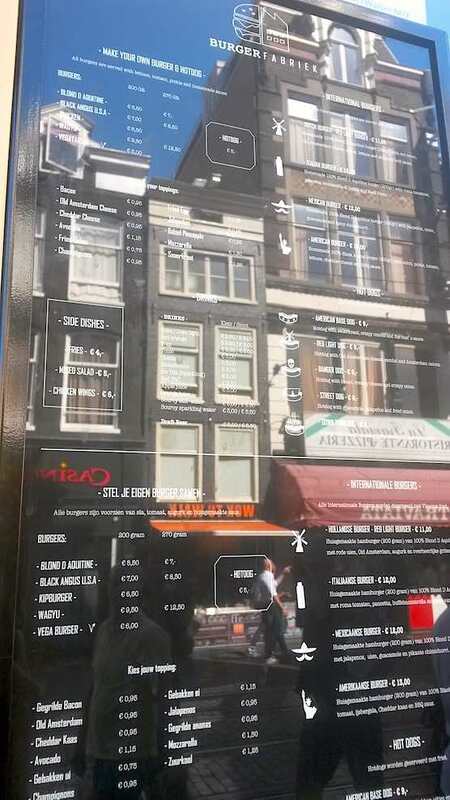 By foot: Restaurant Burger Fabriek is just a 15 minute walk away from Amsterdam’s Dam Square. 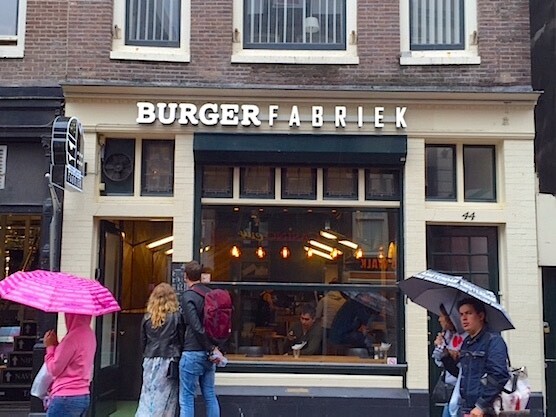 The Burger Fabriek also has a restaurant on the Warmoesstraat in the Red Light District. CLICK HERE to check it out.